Sri Lanka University News Education Campus School ශ්‍රී ලංකා විශ්ව විද්‍යාල පුවත්: Law College Entrance examination Results issue? 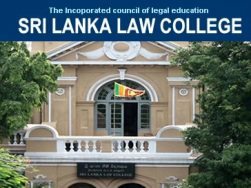 The CID has been tasked with investigating irregularities alleged in the results of the Law College entrance examination in 2013. The decision to release the results on January 10 had been halted following complaints of irregularities in the results for admissions this year. Last year too, the exam was marred in controversy. වසර 2014ට නීති විද්‍යාලයට ඇතුළත් කර ගැනීම සඳහා 2013 වසරේ පැවැති නීති ප්‍ර වේශ තරග විභාගයේ ප්‍රතිඵලවල ඇතිවී ඇතැයි කියන අක්‍රමිකතා සම්බන්ධයෙන් සොයා බැලීමට අපරාධ පරීක්ෂණ දෙපාර්තමෙන්තුවට පවරා ඇතැයි වාර්තා වේ. පසුගිය සිකුරාදා විශ්ව විද්‍යාල පාලක මණ්ඩලය මේ විභාගයේ ප්‍රතිඵල නිකුත් කිරීමට තීරණය කළද, පසුව ඒ සම්බන්ධයෙන් ලැබී තිබූ පැමිණිලි සළකා බැලීමේදී එම විභාග ප්‍රතිඵලවල බරපතල විකෘතියක් ඇති බැවින් මෙම තීරණයට එළඹ තිබේ. පසුගිය වසරේද නීති ප්‍රවේශ විභාගයේ අක්‍රමිකතා හේතුවෙන් මහත් ආන්දෝලනයක් ඇති විය. when will be released the results?? what's the issues gng on? RESULTS OUT UNA DA ! A KAWADA DA ! APATA LAKUNU GAANA WATH DANUM DEN NADDA! MOKAKDA ME LANKAWATA MUN KARANNE ! AI MEHEMA MUSLIMS LA VITARAK GODA DAANNE ! SINHALAYO EPA DA! AI Mr.NAMAL LA SADDA NATHTHE! How many merits in engineering in Gampaha. 2013 A/l my dist. rank is 134 , Am I selected Pera Engineering? how many medicine will be selected for old syllabus?? my island rank is 180 is there any possibility chance to get medicine??? 2014 September thibuna entrance exam results awillada..